Look at your fish tank. You want to notice your beautiful pets. What you don't want to first take notice of is algae growing all over the tank. 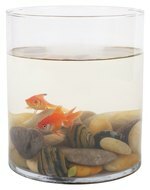 Think about how long it has been since you have cleaned your plastic fish tank. Chances are it is time to do it again. If you have a plastic fish tank, you will need to take some precautions to avoid scratching the plastic as you make the necessary cleaning arrangements. Don't worry, though, because cleaning a fish tank is not difficult. Soon you can enjoy the beauty of your little aquatic friends again. Use the algae scraper to clean the inside of the tank. Be sure that you are using an algae scraping pad that is designed for fish tanks. Regular cleaning pads can have dangerous chemicals in them. Use the plastic blade to clean off any algae that is not removed by the algae scraper. 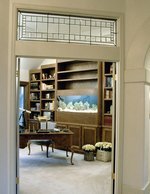 Inspect aquarium decor for algae buildup. If you find any bad pieces, remove them from the aquarium. Use the algae scraper to remove the algae. If it will not come off, soak them for 15 minutes in a 10% bleach solution. Rinse and allow them to air dry to remove all of the bleach. Place the siphon tube into the tank to fill with water. Place your bucket on the floor on top of an old towel. Then, put the vacuum end of the siphon in the gravel and the hose end in your bucket. This should draw the water out of your tank along with the debris in the gravel. Vacuum all of the gravel, but leave enough water in the tank for your fish. Replace the aquarium decorations. Clean all of the outside pieces of the tank using the glass and lime cleaners and your paper towels. Rinse the pieces thoroughly before putting them back in the tank. Wait two weeks before cleaning the filter. This will allow the beneficial bacteria to build up on the rocks and decorations. Clean the filter using a filter brush. Rinse the filter media or replace if it is over three weeks old and has carbon in it.